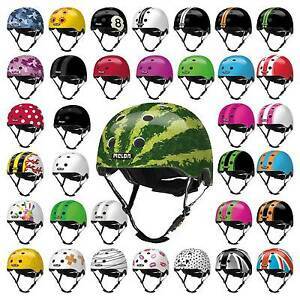 Packed with numerous safety and comfort features, Melon helmets perform as good as they look. Starting on the inside, Melon tackles the inevitable sweat problem with skate-style helmets by added air channels in the foam, that allow air to circulate between the vents. To draw sweat away from the skin, they added Coolmax® pads with sealed edged to inhibit seat dripping. The helmet is also constructed with in-mold foam technologies, versus hardshell, which greatly decreases the weight of the helmet. To protect the exposed foam along the front and rear edges of the foam, each Melon also has a sturdy EPS protective layer. To ensure their helmets stay in place, Melon incorporated a dial-adjust internal cage as well as locking sliders. A Fidlock® magnetic buckle makes buckling and un-buckling quick and easy, while the soft chin pad increases comfort. The Melon also stood out amongst our fleet of helmets, as it fit our six-year-old with a rounder, wider head. Although his head circumference is only 53cm, the vast majority of helmets in his circumference range are too narrow and apply uncomfortable pressure to his temples. Melon’s helmets are wider than most and also comes with three different thicknesses of front and rear pads to further customize your fit (as shown in their sizing charts). 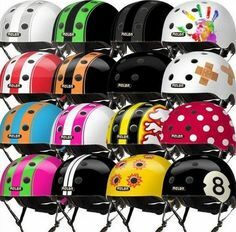 Compared to other helmets, the Melon shares the most similarities with Nutcase helmets, but they are different in several notable ways. The Nutcase is heavier due to its hardshell construction, it has a narrower fit (too narrow for our 6yo) and is dual-certified by the CPSC and ASTM for biking and skateboarding. The Melon is lighter due to in-mold construction, has a wider fit and is dual-certified in Europe for skating and biking, but is only CPSC certified in the US for biking and does not meet the ASTM standards for skateboarding for the US. The difference in their certification is due to their differences in construction. ASTM standards for skateboarding require helmets to be multiple impact helmets, meaning the helmet can withstand multiple impacts to the same location on the helmet. Hardshell construction, in which the outer shell (the colored portion you see) is thicker and is a separate piece than the protective foam, can withstand multiple impacts, while in-mold construction cannot. In-mold helmets are essentially one piece with the “outer shell” and protective foam molded together into one unit. Although lighter, in-mold helmets do not withstand multiple impacts as well (according to the ASTM) since the foam does not have a thick outer shell do protect it. As a result, we don’t recommend Melon helmets for skateboarding, but they are perfectly suitable for biking and use with scooters. This chart outlines all the helmet standards in the US for biking and skateboarding. All bike helmets are required to pass CPSC standards, but skateboard helmets are sadly not required to have any certifications (the ASTM F1492 is optional).